Loyal Cornucopia members are aware of our commitment to closely monitor the activities of the National Organic Standards Board (NOSB). The NOSB has six subcommittees: Crops; Livestock; Handling (generally covering food processing); Materials (mostly agricultural inputs); Compliance, Accreditation, and Certification (CAC); and Policy Development (managing NOSB activities). Each subcommittee regularly meets to discuss items that may be added to the agenda for the full NOSB meeting, and brief notes are posted on the USDA National Organic Program (NOP) website (www.ams.usda.gov). At this time, all committees have a full slate of work, which means that there may not be enough time to include all items in the agenda for this meeting — especially given that the NOP, for “budgetary reasons,” has shortened the fall meeting 25%, from four days to three. Conventional fish farms can seriously harm nearby marine habitats. Unfortunately, organic regulations may allow fish farming patterned on the conventional system. Some of the following items will be discussed and voted on at the upcoming meeting, October 22–24; others will likely be postponed for future meetings. The Crops subcommittee agenda items for the board include Streptomycin (an antibiotic used to control disease of apples and pears) and a petition for use of magnesium oxide (added to liquid fertilizers). Three materials scheduled for sunset, unless reapproved by the NOSB, include sulfurous acid, sodium carbonate peroxyhydrate, and aqueous potassium silicate. The Livestock subcommittee agenda items for the board include synthetic methionine (an amino acid) in poultry feed; acidified sodium chlorite (used as a teat dip for dairy animals); chlorine (for aquatic amimals); tocopherols (preservatives for fish feed); vitamins (for aquatic animals); and trace minerals (for aquatic animals). The Handling subcommittee agenda items for the board include petitions for the use of ammonium hydroxide and polyalkylene glycol monobutyl ether in the boiler water used to produce steam for heat-treatment of food. They also have a petition for the removal of synthetic glycerin from the National List, because the petitioner asserts that certified organic glycerin is now commercially available. The Handling subcommittee also reviewed four materials slated to sunset: gellan gum (a thickening agent), marsala and sherry (fortified cooking wines), and tragacanth (an emulsifier). The Materials subcommittee agenda items for the board include a recommendation for organic research priorities; the process for technical reviews of petitioned materials; the response to confidential business information in petitions; and the use of technical advisory boards and working groups to supply information to the NOSB. 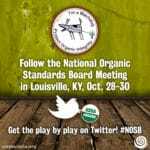 The subcommittee also voted to include a proposal on production aids in the NOSB agenda, but the National Organic Program staff removed it from the agenda. 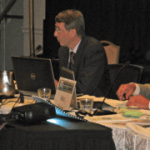 The Compliance, Accreditation, and Certification (CAC) subcommittee items for the board agenda include proposals on voluntary retail certification; how certifiers verify the practices farmers use to prevent insect and disease outbreaks; and the NOP’s recent initiative, Sound and Sensible Certification (a new initiative). The Policy subcommittee items for the board agenda include a conflict of interest policy; voting on sunset materials; numerous small but important changes in Board procedures. In addition to the above permanent subcommittees, there is an ad hoc GMO subcommittee. They are working on seed purity — avoiding the contamination of organic seed with genetically engineered DNA — and the terminology to define excluded methods (genetic engineering) in plant breeding. As The Cornucopia Institute constantly remains aware of the NOSB issues, educates consumers, and advocates high organic standards, we act as a true “watchdog” for the organic industry. Aquaculture Standards: Something Fishy Going On? Eating organically can be a dilemma for seafood lovers. There are no USDA certified organic fish, shrimp, or oysters, because the National Organic Program (NOP) has not established standards for aquaculture. The NOSB approved final recommendations for aquaculture in 2008, but they have not yet been passed into law. Ideally, organic regulations would encourage sustainable fish farming. A closed system, raising herbivorous fish on organic feed and recycling their wastes, could offer local organic fish. Unfortunately, it appears likely that the USDA’s NOP may allow fish farming that is patterned on the conventional system — open net pens that float in the ocean and allow feces to pollute the water. These conventional systems have seriously harmed marine habitats near the fish farms. In addition, many of the farmed fish are salmon — a carnivorous fish that migrates into rivers to spawn. Farmed fish are fed soybeans (an unnatural food for fish), which requires many nutrients to be added to their food. Salmon are also fed small fish, which depletes fish stocks. At Cornucopia, we have grave concerns about the environmental impacts of large-scale fish farming in open waters. We also have concerns that cultivation of carnivorous fish, such as salmon, may simply be too damaging to the environment to ever be labeled as organic. Despite the lack of aquaculture standards, the NOP formally requested that the NOSB review aquaculture materials. These petitions are under review and were open for public comments (until Oct. 1) and up for vote at the fall NOSB meeting. The Cornucopia Institute will prepare comprehensive analysis of this and other petitioned materials. We hope that you’ll join us in voicing your opinion to the NOP. Watch Cornucopia’s website, www.cornucopia.org, for analysis of the NOSB fall meeting agenda items.